Saracens Social Touch Rugby is back! The league has come to an end which means one thing.. its social touch time again!! Come join us on the 15th April for our first session. Whether you’ve never played before, or are a touch pro, all abilities are welcome! So invite your mates and spread the word- lets make this years touch season even bigger. We will run a grab a bib and play set up so you will have the chance to play with a range of people each week. The price is 20AED, play before your pay. There may only be one winner, but in touch everyones a winner so we shall all be celebrating after in Murphys pub- come join for some top quality food, beverages and chat. https://www.saracens.ae/wp-content/uploads/2019/04/Teaser.png 1125 1800 Coach https://www.saracens.ae/wp-content/uploads/2018/09/abu-dhabi-saracens-rugby-club-sml-logo.png Coach2019-04-05 01:07:092019-04-05 01:07:14Saracens Social Touch Rugby is back! 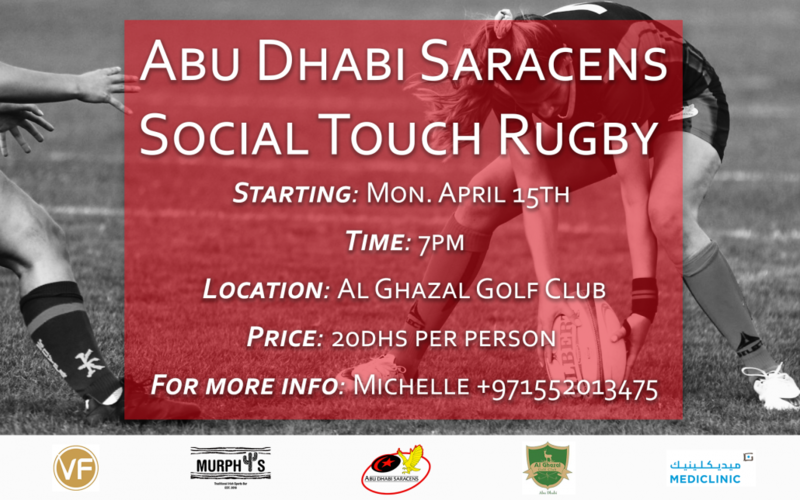 The Saracens are a successful rugby club based at Al Ghazal Golf Course in Abu Dhabi. Competing in the UAE Conference and UAE Womens 7 Series.